The ghost of Uncle Billy? There’s an ancient grave somewhere in Pine Hill Cemetery, Auburn’s oldest, etched with the words: “Let it be said that here lies a man.” I saw it one day exploring during my sophomore year when I lived across the street from the cemetery at Neil House. I haven’t been able to find it since, but I want to, want to take a picture of it, because it’s pretty much the most badass thing ever said about anyone. Maybe I’ll see it tonight on the almost-annual Pine Hill Cemetery Lantern Tour… because now that I think about it, that’s totally something that would be on the grave of an Auburn legend. Since 1995, the Auburn Historical Society has dressed volunteers up as A-list characters from Auburn history: Judge John Harper, the city’s founder, who donated the six acres for the cemetery back in 1837, Alpha Cullars, Dr. Charles Cary, Simeon Perry and B.B. and Letitia Ross. You walk up to their graves and their 21st century thespian avatars give you the lowdown on what life was like was like in Auburn during the late 19th to the mid-20th century. You’ve also got your lesser-knowns— your Gatsy Rices (the only know slave who’s grave is marked in Pine Hill) and your Virginia Howes (the 16 year old who was buried in her front yard and later moved to Pine Hill her her husband-stealing sister). 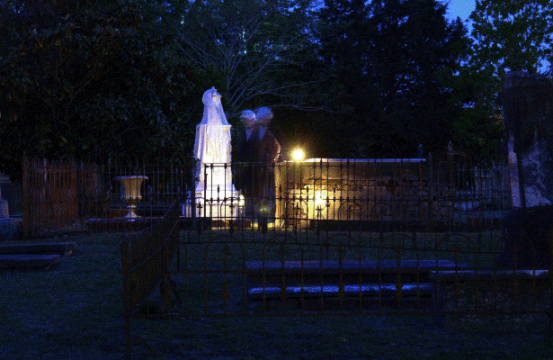 The tour will be held at Pine Hill Cemetery, located on Armstrong street, Oct. 6 and 7 from 7—9 p.m. Tickets are $10 and include a tour program. The Tallassee String Band will be keeping it real at the gate. Parking is available at Auburn Junior High—and there will apparently be a trolley to get you the rest of the way—but I’ll probably still feel entitled to my old spot at Neil House. Maybe I’ll find that old grave, maybe I won’t. It’ll be worth it as long as I get to meet “Uncle Billy”… because let it be said that there lies a man who insisted on being buried above ground on top of his twin bed with his shoes underneath it. Related: Pine Hill Haints release track to honor Toomer’s Oaks.